On a daily basis, I call insurers to get their stance on liability or an offer in settlement. When they do answer the phone which isn’t often it’s eye-watering the excuses put forward to justify the collision or reduction in the value of a claim for injury. 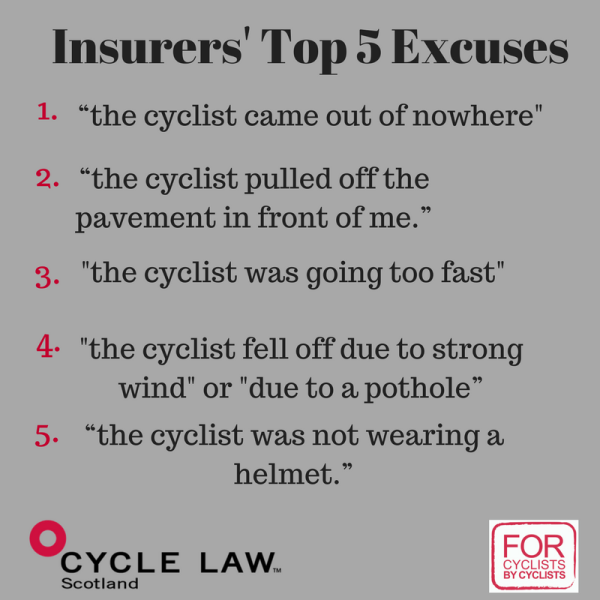 So I thought I would share the top five bizarre excuses by insurers. At number one as it’s the most common - “the cyclist came out of nowhere.” Oh come on, unless you are on the Star Ship Enterprise, you must have come from somewhere! Ah, but those cyclists that do come from somewhere have clearly been hanging around on pavements waiting for an opportunity to pounce on unsuspecting drivers - why? because that’s excuse No2 - “the cyclist pulled off the pavement in front of me." Excuse No 4 - "the cyclist just fell off." “There was no collision and the cyclist just fell off" was advanced by an insurer in the case of the driver of a large HGV passing an elderly cyclist by just inches. The cyclist was caught by the backdraft and fractured his shoulder. We recovered full damages for the cyclist. Another excuse –“there was no collision, the rider hit a pot-hole and fell off“ was actually used as a defence in a case that got all the way to Court. The lady driver turned left without checking her nearside wing mirror and knocked my client off his bike. When all the evidence irrefutably pointed to the driver, the case was settled just 4 weeks from a final hearing when the insurers capitulated and paid full damages. It’s not just that cyclists fall off pavements and their bikes for no reason, it’s also the case that they contribute to their own injuries. Yes, but he fractured his clavicle so what difference does it make what he had on his head? Believe it or not, I had one insurer saying their policyholder would have seen my client had he been wearing fluorescent clothing. The collision occurred at 2 pm on a bright summers day!! Sadly it’s all too common to be faced with such excuses and it can lead to protracted litigation. Insurers can spin out a case with such excuses turning it into a 'David v Goliath' battle but we all know who won that one! 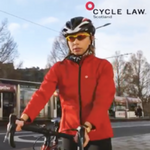 At Cycle Law, we’ve probably heard it all but we remain resolute and determined in our mission to provide cyclists across Scotland with a first-class legal service from experienced cycling lawyers. Insurers should know better and not try their excuses on us. They just won't wash.